81 to Go: Who Needs Hits? 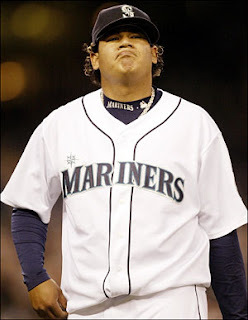 And the offensive hero of the game was...Felix Hernandez? Yes - King Felix hit a grand slam in the 2nd inning off Johan Santana. Apparently, the only player on the team who can hit the ball is a pitcher...Who hardly ever gets to hit because he plays in the American League. Awesome. And Mr. Santana, you'll be happy to know that King Felix figures this was his first home run since Little League. Good job, buddy. It was the first grand slam by an American League pitcher in almost 40 years, and the first home run by a pitcher in Mariners history. So how did Felix celebrate this milestone? By spraining his ankle while covering home plate and leaving the game before he could get the win. This is where I would usually make a Mariners joke, but there's no greater joke than the team they put on the field every day. Zing!